Size of Male: 50-75 lbs., 24-27 in. Size of Female: 50-75 lbs., 22-24 in. As their name suggests, Irish Red and White Setters are parti-colored dogs with a base coat of white that’s splattered with solid red patches. This spirited and friendly breed comes in two varieties: the field type that excels in hunting and the bench type that stands out in conformation shows. Either way, both are sure to raise the energy level of your home to greater heights. Not to be confused with the Irish Setter, their solid red-haired cousins, the Irish Red and White Setter is actually the older but less popular Irish Setter. The breed dates back to the 17th century. However, a fascination for the then rare solid-colored dogs led to the decline of the parti-colored variety. Efforts to save the red and white dogs from extinction during the 1920s did not pay off until the 1940s when the Irish Red and White Club was founded to revive and preserve the original breed. When you behold the Red and White Irish Setter today, you’re actually seeing a living reminder of the past! The breed still enjoys a modest following, but the numbers are far from extinction. Though fine gun dogs in the field, this dog breed is surprisingly sociable inside the home. Poor guarding instincts make the pooches friendly around other pets (except cats). A combination of intelligence and affection may sometimes manifest as mischievous behavior. If you are too soft and too busy to get physical, this may not be the right breed for you. Without sufficient mental stimulation and physical exercise, the Red and White Irish Setter easily engages in destructive behavior. Living Environment – A small home or an apartment in the city is far from ideal. In fact, this dog breed fares best in a countryside setting where they have plenty of space to move about. A large yard is highly recommended for this lively breed. Grooming – These “gun dogs” are average shedders. Nevertheless, daily brushing is a must. This includes checking the ears and plucking any loose hairs by hand. Baths and shampooing are not mandatory, so you may give your pet these only as needed. Diet & Exercise – As bloat is commonly seen in many Irish Red and White Setters, do not feed your pet once a day, only. Instead, schedule the meals to at least twice daily and always provide access to clean water. Go easy on commercial dog food. The dog’s exercise requirements are above average, involving lengthy and daily jogging and brisk walking. There is a protocol that you must follow with this breed: Let the dog walk beside you or behind you – and not in front of you. Since the dogs are accustomed to following “the leader of the pack,” allowing them to take the lead often gives rise to behavior control difficulties. Health – In addition to canine hip dysplasia, heart disorders, anemia and canine hypothyroidism, there are 3 hereditary concerns seen in some Red and White Irish Setters. They are posterior polar cataract, von Willebrand’s disease and CLAD which stands for canine leucocyte adhesion deficiency. Careful breeding and vigilant monitoring have reduced the CLAD and von Willebrand’s disease cases significantly so that fewer than 10 percent of the dogs are afflicted by the disorders. Intelligence and training times don’t necessarily go together with this dog breed. Even though they are good in problem solving, the pooches can be quite a challenge in the area of behavioral training. They are capable of learning many tricks but take plenty of time in the process. Irish Red and White Setters also require a patient and firm handler. Winston, our wonderful, loving, playful Irish Red and White Setter that just turned 6 years old. 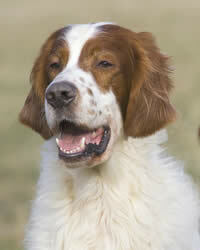 I have a pair of Irish Red and White Setters . 7 weeks ago the dam had 9 pups.